Shell Cameos set in 950 silver with gold plating as cufflinks. Special edition made in honor of the 500th anniversary of the discovery of the Pacific Ocean by Vasco Nunez de Balboa. 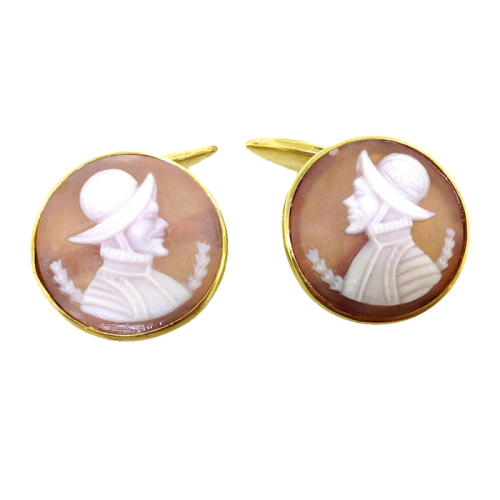 Shell cameos, set in 950 silver with gold plating as cufflinks. Certainly a conversation piece for a style conscious man. Cufflinks are definitely a status symbol, especially when you have the only pair in the world! Artist signed originals. Registry #J4267/J4268. Sold with a Certificate of Authenticity. Eco-Friendly, Fair-Trade.